The Jewish community in Ramla apparently started with the foundation of the city. They were mainly occupied with artisan workmanship, shop keeping and trade with neighboring countries. The Jews had their own market called "The Jewish market"/ part of the shops served as Heqdesh for the Yeshiva "Gaon Ta'akov" that was located in Jerusalem and for the poor people of the town. The economic situation of the Jews of Ramla in the early Islamic period was firm. A few Jews served in high ranking positions as advisors of the Sultan – an example was Jacob Ibn-Killis, who served for a time as "The merchants' Officer". He later converted to Islam and even became a Vizier at the end of the 10th century. Other Jews who lived in Jerusalem acquired stores and apartments in Ramla in order to assure their livelihood, and many of them became accustomed to staying there for long periods of time. In Ramla there were a number of synagogues. One of them was called El-Shamein, that is, of the residents of the land of Israel and Syria, composed of a "Jerusalem" community. In addition there was also a Babylonian community with its own synagogue. And there were several Karaite synagogue and almost certainly another synagogue for the Samaritans. in the Genzia that was discovered in an ancient synagogue in Egypt many documents were found written in Hebrew and Arabic from the tenth and eleventh centuries that tell of the existence of Jews in Ramla on matters concerning divorces, monetary cases, disputes over land, ties with the Jews of Jerusalem and Egypt and the like. From a document that was sent from Ramla in 1039 we can deduce that there were more than 1000Jews in Ramla at the time. The Karaite community in the city disappeared in the eleventh century. It was renewed after the establishment of the state with the arrival of members of the community from Egypt who settled in Ramla and its environs. 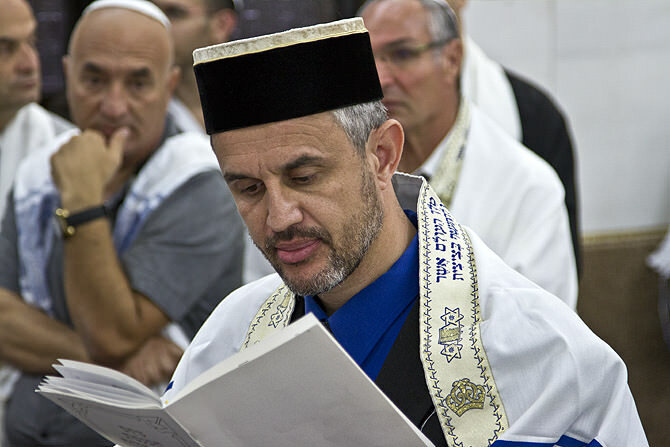 Today Ramla serves as the most important center in the land for members of the Karaite community with its main synagogue and community support organizations. The dwellings in Ramla in the middle ages were built mainly from stone and were two or more stories high. The main activities of storage, baking and cooking were done in the courtyard area that was walled with stonewalls. Wheat grain was ground with hand mills made of basalt stone in order to prepare flour for baking fresh bread daily. For baking they used simple ovens dug out in the ground or built above ground. They drew the water from cisterns, wells or nearby streams and they would store it in large clay containers. In many courtyards there were fruit trees such as date palms, pomegranates, fig trees, grape vines, and citron trees and also a place for a vegetable garden for the home. In a separate place they kept the livestock that served as supplementary food: chickens, goats, sheep and also donkeys that served as the main beasts of burden for the city folk.